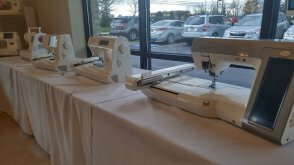 We have hundreds of pre-loved sewing machines, sergers, embroidery machines, quilting machines, and quilt frames at amazing prices. Just a few of our currently Pre-Loved machines include. Inventory changes quickly please call for actual availability! Looking for the perfect machine at the perfect price? Let us know! Looking for a specific used machine? Give us a call and let us do the footwork for you to help you find your perfect machine.